Good question, considering how prevalent among Christian churches is the custom of getting together for a Sunday service. As usual, the question we must ask is, “What does the Bible say?” And yes, the Bible does prescribe taking one day a week, “the seventh day,” as God did, for a “Sabbath.” It is most important to understand that the word “sabbath” is a Hebrew word that means “a rest.” A day of rest was to follow six days of work. It actually had nothing to do with going to a worship service. The key question is for whom is, or, more accurately, was the Sabbath prescribed? “What does the Bible say?” That is always the “bottom line,” but the answer must be understood in light of to whom the Bible is speaking. Scripture says that in the spectrum of human history there are three, and only three, basic groups of people: “Jews, Gentiles, and the Church of God” (1 Cor. 10:32). Each part of God’s Word is written to one (and sometimes more than one) of those categories of people. As I like to say, it’s all about pronouns. As the Messiah, Jesus came to Israel, and his message was specifically to them. Certain parts of it, e.g., Luke 6:38 (“Give, and it shall be given to you…”), are pertinent to us today, but most of what he said is directly regarding Israel and based upon what is written in the Old Testament, which is all they could understand. 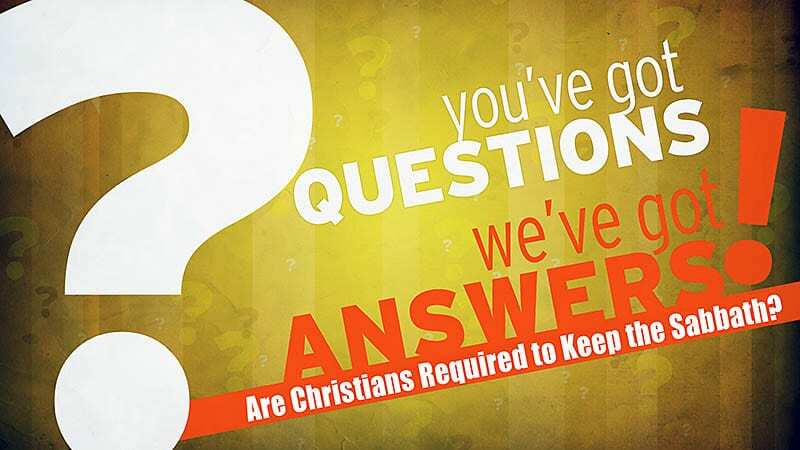 That which was specifically addressed to Israel was superseded or changed in the Church Epistles, which are written specifically to Christians. Some people might say, “you’re placing the words of Paul above the words of Jesus.” No, because the Church Epistles are also the words of Jesus, as per Galatians 1:11 and 12. The question is: to whom was Jesus speaking? The Church Epistles, and Ephesians to the most pronounced degree, speak of “the Sacred Secret” (mistranslated “Mystery” in most versions, with Rotherham’s Emphasized Bible, and three other versions being the exceptions). The Greek word musterion meant “secret,” that is, something that can be known and communicated from one to another (as opposed to a “mystery,” which no one understands). Ephesians 3 is clear that this Sacred Secret was not even conceived of in the Old Testament or Gospel period, but hidden in God until He revealed it to Paul. The Sacred Secret was that there would be a new group of people—not Jews and not Gentiles—people who would be born again of incorruptible seed, whose salvation would be unconditional and assured. That is good news! The Greek word oikonomia appears nine times and is best translated “administration,” that is, a way in which God relates to mankind, the “rules and regulations” if you will, for the people on earth during a particular time. Let the record show that God is very clear in His communication to people about what He expects from them in each administration. This is much like presidential administrations in the USA. When a new president is inaugurated, some things remain the same and other things change depending upon his decisions as to how things will be during his presidency. Then people choose whether or not to adhere to the rules. It was during the administration of the Law (Exod. 20:1 through Acts 1:26) that Jesus first came to the earth to Israel. He was born, lived, died, was resurrected, instructed his disciples about the coming gift of holy spirit, and ascended to heaven. That is why he kept the ceremonial requirements of the Mosaic Law by observing the Sabbath, being baptized in water, etc. We are now living in the fifth administration (Acts 2:1 through Jude 25 / Gentiles, Jews, & Christians), which Ephesians 3:2 calls the administration of God’s grace and 3:9 calls the administration of this Secret. It began on the Day of Pentecost (Acts 2) with the outpouring of the gift of holy spirit on all who believed in Jesus as the risen Lord and ends with the gathering together (“Rapture”) of the Church to meet the Lord in the air. (8) “Remember the Sabbath day by keeping it holy. (10) but the seventh day is a Sabbath to the LORD your God. On it you shall not do any work, neither you, nor your son or daughter, nor your manservant or maidservant, nor your animals, nor the alien within your gates. (11) For in six days the LORD made the heavens and the earth, the sea, and all that is in them, but he rested on the seventh day. Therefore the LORD blessed the Sabbath day and made it holy. (17) These are a shadow of the things that were to come; the reality, however, is found in Christ. In Colossians, the “you,” of course, is those born again of God’s holy spirit, for whom no such Sabbath observance is ever prescribed. In fact, the above verses are saying that there is no such thing that is relevant to the Church, the Body of Christ, Christians. Do the Church Epistles say that Christians should get together with others and sing, praise, worship, pray, minister, share financially, hear the Word, etc.? Absolutely. But there is no prescribed day—or way. Consider this: if Christians are to keep the Sabbath, should they not keep the whole Law? In Galatians 5:3, Paul says just that, substituting circumcision as the part of the Law in question. Take a good look at verses 1–15 in order to get the whole context, and to see what Paul (writing by revelation) thinks about Christians being put under any part of the old Mosaic Law. If we are to keep the Sabbath, what about animal sacrifices to worship God? The epistle to the Hebrews was one of the earlier epistles and was written primarily to ex-Jewish Christians (which all the first Christians were), many of whom were still clinging to their old ways. In Hebrews 7–10, God works hard to show them that the Mosaic Law was no longer applicable, for example: (7:18 and 19) “The former regulation is set aside because it was weak and useless, (for the law made nothing perfect), and a better hope is introduced, by which we draw near to God;” (9:9 and 10) “[The Tabernacle was] …an illustration for the present time, indicating that the gifts and sacrifices being offered were not able to clear the conscience of the worshiper. They are only a matter of food and drink and various ceremonial washings—external regulations applying until the time of the new order;” (10:1) “The law is only a shadow of the good things that are coming—and not the realities themselves…” Amen. Some Christians who do not understand the administrations in Scripture and who thus believe we should observe the Sabbath, etc., cite Matthew 5:17–19, where Jesus said that he had not come to abolish the Law but to fulfill it. First, to whom was he speaking? Jews. The Mosaic Law never did have anything to do with Christians. A key phrase in what Jesus said in Matthew 5:18 is that nothing would disappear from the Law “until everything is accomplished.” Jesus did accomplish everything he needed to relative to the Levitical Law, and that’s why it is no longer in effect. Today, we have no Temple, no Levites, no Aaronite priests, no animal sacrifices, etc. For both Jews and Gentiles, adhering to Romans 10:9 is the way to salvation. In closing, perhaps you are aware that a good number of Christians today are arguing about whether “the Sabbath” should be observed by believers meeting together on Saturday or Sunday. This needless conflict would evaporate if they understood that (a) the word “sabbath” means “rest,” and (b) neither day pertains to Christians as a special day, because for believers in the Administration of the Sacred Secret, every day is special. The argument is fruitless anyway because, based upon the consensus of Church historians, it cannot be definitely determined just when and why the early Church came to observe what we call “Sunday” (“the first day of the week”) as the day to gather together for fellowship, prayer, teaching, etc., rather than what we call “Saturday,” which was when Israel observed the Sabbath.